I haven’t sat at my sewing machine in a couple weeks, today I set aside a couple hours to work on my mini quilt. I started it a few years ago and is in my list to complete this year. The top at least, I probably won’t quilt it till next year. The blocks are 2″ when finished. Pretty small for me, but I’ve seen smaller blocks. 21 down, 35 to go. While working on the mini I’ve also been making my leader/ender blocks. I also finished a client quilt today. A patriotic wall hanging. I quilted my fire leaf design in the background and continuous curves in the print. And this is just a pic of my silly dog. She sleeps in the funniest ways. This weekend myself and some guild members got together to sew blocks for the back of our opportunity quilt. We were making “liberated” letters. I was out of my comfort zone. I’m very used to exact measurements not “about this size” instructions. After the second “A” I was getting used to the process and made a total of three A’s and three M’s. It was fun but I’m not sure I’ll venture into blocks without instructions anytime soon. Loaded up and started a new quilt this morning. Fresh bright colors on a white background, so eye pleasing. I’m quilting swirls and feathers all over this strip quilt, there is embroidered appliqué about half way down that I’ll stitch around to enhance the motifs. This happy girl loves going on morning walks to school and today was especially exciting for her. She got to madly bark at the neighbors cat who made her way into our yard and then a squirrel caught her eye near the corner of the street. At 2 years old she has tons on energy and loves chasing whatever she can. Thankfully her leader makes it easy to control her pulling. This quilt is almost done. The center blocks are quilted as well as the sashing, the pieced border and outer border are what remains. My client is actually taking the quilt back to mark the outer border in an overlapping chain. We both thought it might be easier for her to mark it out since the border is not easily divisible. So I’ll get it back in a few days to complete. This weekend was also filled with family time. We went to dinner with some friends, decorated the yard for Halloween and watched my son play baseball. He had 2 great fly ball catches, in left field and at 2nd base and was walked twice. Proud mama here. This week I’m planning to finish two more quilts, work on piecing one of my own and another baseball game on Sunday. Christina, among with myself and many others, are on a quest to finish up works in progress. She started this top 10 years ago and handed it off to me to quilt. Christina wanted me to quilt roses to go along with the floral print and do my thing with the rest. With this much negative space and a traditional pattern my thing would be a lot of feathers. Since my machine is not computerized, the roses were done feee hand, sort of. I found a rose motif in an older book of mine and traced it on to paper then made almost 40 copies to quilt on. I aligned the motif onto the square, pinned in place and started to quilt. Since the tracing paper would need to be removed easily, I increased my stitches per inch to better perforate the paper. Once done I gently pulled the paper away from the stitching. Any little bits of paper left behind can just be scratched away with your finger nail. Christina loves her quilt and will be happily binding it soon. As for me there is baseball and hockey to watch tonight and probably some appliqué while the games are on. August was a busy and fun month. We had a family day at the beach (need to do that more often) baseball tryouts for my son, school began ☹️ and of course I quilted. Many projects were completed for my clients and I worked on piecing a couple of my own. 5 Quilts were done for Maxine. And when I returned her quilts to her she gave me more! Those will likely get done late this month. The two blue and yellow quilts are baby size and are for grandchildren. The pear and hexi-floral were fun custom quilts. I love swirls and feather together, such fun texture. The large quilt also includes lots of feathers, swirls and loops. Mary made a beautiful sampler quilt, these are just a few of the blocks in the quilt. Linda made a gorgeous appliqué vases quilt. The pattern is from Piece O’ Cake. As I’m looking through my photos I realize there are a lot for August so I’m going to continue with those tomorrow. But I did want to include the progress I’ve made on my scrappy leaders and enders quilt. I have 8 of 14 rows done! No quilting happened for me on Wednesday, we spent the day at the beach. It was a much needed day. Sand between my toes and sound of waves crashing is exactly what I needed. The sun stayed behind the fog most of the day but that didn’t stop my son and his friend from playing in the surf. And it didn’t stop my husband from becoming a burnt lobster. As much as I warned him to put on sunblock he just wouldn’t. Today I got farther on my 2016 mystery quilt. I can see the end! Friday I will finish it and then get back to clients quilts. Finishing this quilt will be my personal finish #3 for the year. My goal is 6 so I better schedule more time for my own projects. We are in the second heat wave of the summer here in Los Angeles. I need to head into my studio early to quilt before the temperature gets to be too much. This morning I quilted a quarter of the way through this top. This quilt is actually one of my own! Like most quilters I have a stack of quilt tops waiting to be quilted. I have a goal to quilt 6 of my own tops this year and it is already July. This will be finish number 2 and I think the largest of the ones I want to finish. About this quilt, the pattern is by Bonnie Hunter called En Provence. This was the 2016 Mystery Quilt and my mom and I pieced it together. While the mystery clues were being given my cousin became engaged and we decided to give this quilt to her and her husband. Well their one year anniversary is this month so I better get this done. The binding is already made so I can get to the finish quickly. Hope summer is treating you well and you get to spend time with your loved ones and of course your sewing machine. The past few weeks I have happily found myself in front of my sewing machine working on projects for myself and others. I finished a baby quilt for a friends godson that was recently diagnosed with leukemia and is going through treatment. And I had enough fabric left over for a pillowcase. I’ve also finished some clients quilts. Well, a lot actually but here are a couple of recent ones. Both are baby quilts, the first one is on its way to Germany in a couple of days. The second one is a flannel crazy quilt with woodland creatures appliquéd. Tonight I plan on finishing up making binding for another quilt top I recently finished. Hopefully I’ll quilt it in the next couple of months. This Friday and Saturday the Glendale Quilt Guild hosted its quilt show. A few of my clients had quilts hanging in the show and a couple even had ribbons! Tim’s Bargello quilt is just gorgeous. Yep, that’s a blue ribbon hanging next to it, the category was show theme. I really enjoyed quilting this beauty, swirls, pebbles and echoed hooks. I wanted to keep the idea of flowing water. Typically I don’t like pictures of me but how could I not take a pic with Tim and his quilt. Three of Alice’s entries were quilted by me. Alice’s appliqué is always superb. 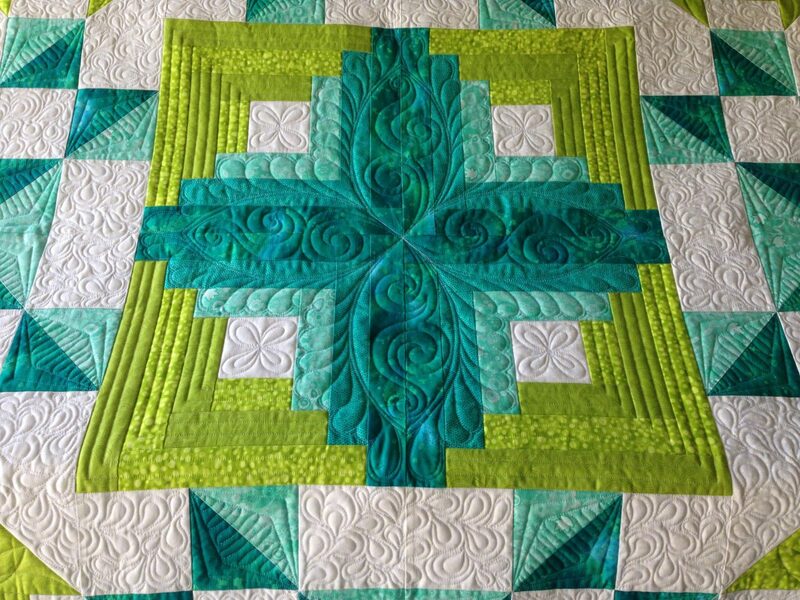 Simple cross hatching to enhance the blocks, leaves in the sashing and feathers for the border. The houses quilt has straight lines in most of the background, the houses have echo quilting and the sky print has clouds. The last quilt is an all over design. Donna’s quilt was her first mystery quilt. I quilted feathers in the setting triangles and border, the square blocks are cross hatched and a continuous line design in the star blocks. The show was a nice. About 300 quilts were hanging, 140 of them were quilt entries by 46 members. The rest of the quilts were various exhibits by other guilds, Hoffman Challenge or teachers.